Larry Hancock | Someone talked and I wrote about it. This update is for the folks who have been following our Wheaton Names research over the past several months. I’ve blogged a few times and we did put up a link to an early research paper on the work, but since then we’ve gone much further in some respects…and hit a bit of a wall in the process. With the assumption that Wheaton did hear remarks about the attack on JFK, among the “war stories” that Carl Jenkins and Rafael Quintero were exchanging with their friends, the obvious question is who were those friends and what would Jenkins and Quintero have in common with them. That obvious answer – given that Wheaton and Jenkins were trying to get into the air transport/supply business for the Contra military effort against the Sandinista’s, is that they were meeting with the two field agents in charge of handling those shipments. That would be Rafael Quintero and Felix Rodriquez. Further research shows that both Quintero and Rodriquez had an extended history in anti-Castro paramilitary operations Carl Jenkins, making Jenkins a perfect selection for Wheaton as his sales manager. That history, combined with the documented personal relationship between Wheaton and Quintero, explains why Wheaton might well have been in a position to hear the sorts of war stories and remarks about JFK which he ultimately attempted to report to the ARRB. Research into Quintero and Rodriquez has also provided a good deal of detail on their association with Jenkins. It began with the earliest volunteers for the CIA’s Cuba project, and their training at a base in Panama – training overseen by Carl Jenkins. During 1960 a group of those earliest volunteers was pulled for additional training at the secret CIA training installation in Belle Chase, outside of New Orleans. Ultimately those individuals, along with personnel trained in intelligence collection and practices by David Morales, were covertly inserted into Cuba to make contact with resistance groups and report on conditions inside Cuba. Several of them were also deployed on maritime insertion missions in the months immediately before the landings at the Bay of Pigs, on supply missions – and as we learned – on highly secret attempts to kill Fidel Castro in a series of planned ambushes and sniper attacks. They were part of a last ditch effort to decapitate Cuban leadership before the landings, an effort which included the notorious poisoning project but which was more extensive than the CIA ever admitted in its reports on the Cuba Project, or later to the Church committee. 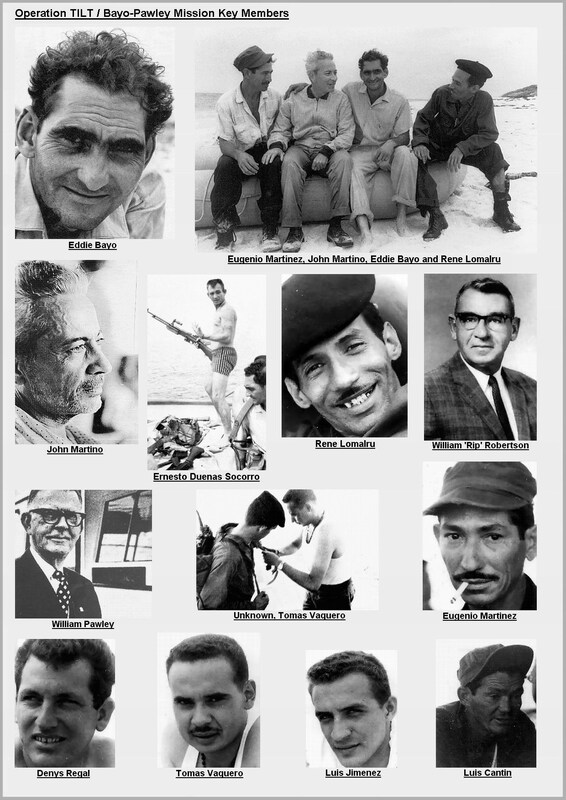 Due to the nature of those missions, the majority of those individuals, including both Quintero and Rodriquez, did not end up in Cuba prisons; they and several of the other individuals being used in the pre-landing maritime missions (operated out of the Florida Keys, with some, including assassination missions overseen by Carl Jenkins) continued working in covert CIA operations including maritime missions into Cuba – overseen by CIA paramilitary specialist Rip Robertson. Those missions decreased over time, particularly after the agreements with the Russians which helped resolve the Cuban missile crisis of fall 1962. By mid-1963 several of those individuals has essentially been taken off missions, some held on retainer but most simply looking for ways to continue efforts against Castro. In the summer of 1963, several of them (who were DRE members) participated in two abortive efforts to carry out bombing missions against Cuba. At the same time that was going on, the Kennedy Administration had decided to support a new, highly autonomous off shore effort against Castro (AMWORLD), headed by Manuel Artime and with Quintero as second in command. Carl Jenkins was assigned to perform CIA oversight over Quintero and the initial military operations against Cuba. What we have learned is that a particular clique of the most committed anti-Castro fighters, the earliest volunteers for the Cuba Project, the individuals given advanced training and sent into Cuba in high risk maritime missions – including assassination attempts were some of the earliest recruits into the new AMWORLD project. The joined the project in the August and September time frame – but the project itself did not begin covertly exfilitrating personnel out of the U.S. until January/February 1964. For all intents and purposes those key individuals, very possibly including some of the names mentioned by Quintero, Rodriquez and Jenkins in the conversations Wheaton overhead, simply go out of sight. They continued to live in the US, they continued to travel and take some amount of training, apparently most continued to reside in the Miami area. However while they were in the process of being given covers, they simply went dark. AMWORLD did have money for domestic activities, including travel and purchases. And it was all done outside of CIA control. It was autonomous and so were its members to a large extent. There is some indication that certain of the individuals we begin following in Carl Jenkins training camp in Panama in 1960 were traveling to Texas in the fall of 1963. Several of them were active DRE members and could have used that affiliation as a dover in their travels to New Orleans and Dallas; some were definitely in New Orleans in the summer when Lee Oswald was there. But pinning down their movements in the fall is a real challenge and largely speculative at the moment. In one instance it appears that the links may extend to Red Bird airport and the remarks made to Ray January by a Cuba pilot immediately before the attack on JFK. But fully confirming that is a challenge in itself. So…do we have names that fit the Wheaton story; absolutely. Can we show them to be associated with each other and to be among the most committed and aggressive Cuban exiles; yes. Some among them were expert marksmen and had volunteered for use in sniper attacks on Castro. They were among the most skillful of the trainees at both infiltration and exfiltration, going in and out of Cuba multiple times even when Cuban security was at its highest. Manuel Artime had requested several of them by name as his own special security team. They were also among the first volunteers for his AMWROLD project in 1963. Can we put them in Dallas for the attack, no we can’t. We have suspects, at the moment because of the autonomous nature of the AMWORLD project and its limited reporting, moving the ball further down the field is proving to be quite challenging. Posted by larryjoe2 on April 20, 2019 in Everything else. By mid-1963 President Kennedy was well into several initiatives that were moving covert military operations away from the CIA, and personnel in the CIA Directorate of Operations were not happy with that direction. JFK had already transferred covert operations against North Vietnam to the Army and 1962 had seen the multi-agency Mongoose program against Cuba – with the CIA strictly in a support role. By the summer of 1963 JFK was looking at several options, including turning covert Cuban operations over to the military (if he determined to return to that tactic), exploring a totally autonomous offshore Cuban exile initiative with AMWORLD, and even pursuing the possibility of some sort of political accommodation with the Castro regime if Castro was willing to break from the Soviets. The President had taken a number of measures to ensure oversight and control of CIA operations against Cuba, requiring sabotage projects to be proposed and reviewed in detail. The Special Group Augmented was also tasked with increased oversight of all covert operations. However we have reason to suspect that control was not nearly as complete as intended. We have indications that the CIA, in particular the Directorate of Plans/Operations was still capable of acting acting quite autonomously, certainly at the level of JMWAVE activities – which included infiltration, exfiltration, intelligence collection and limited support for the few on- island resistance groups still rumored to exist. The extent of that operational autonomy can illustrated in one particular operation which came to be designated as TILT. I’ve written about TILT before but my friends David Boylan and Bill Simpich continue to dig up documents which provide further insight – and a dramatic illustration of how JFK could indeed be isolated from extremely risky field activities. In the case of TILT, a mission which if it has come out as planned, would literally have shaken his administration to the core, very possibly shattering JFK’s chances for reelection. William Pawley, had a long history with the CIA, including acting as a special advisor to President Eisenhower on the performance of the Agency. He also had close personal connections to senior CIA officers such as J.C. King, Chief of the Western Hemisphere Division, Ted Shackley, Chief of Station at JMWAVE and Marshall Carter, CIA Deputy Director. In regard to the reports of Soviet defectors inside Cuba, Pawley approached both Shackley and Carter, offering his own resources and asking for JMWAVE support in extracting them. 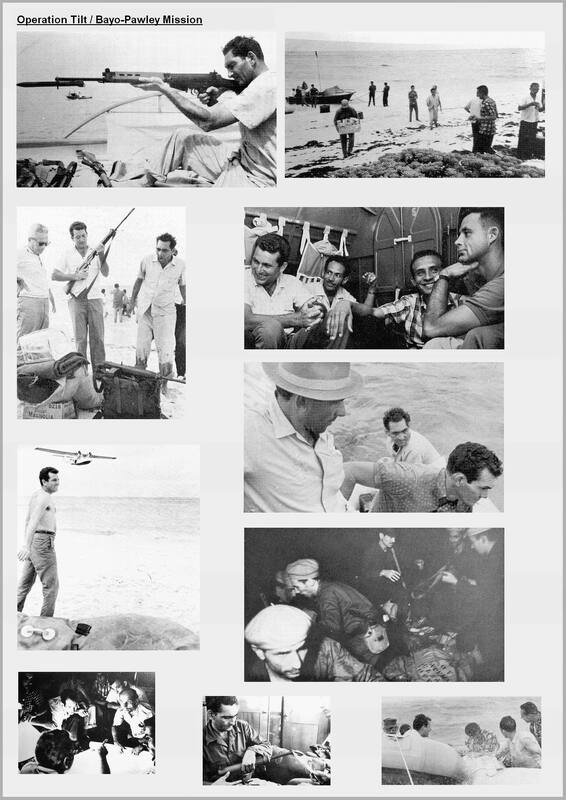 Ultimately the operation evolved into a rather complex mission including multiple boats, a PBY type plane, a set of totally unvetted Cuban exile volunteers led by Eddie Bayo and the personal involvement of William Pawley, John Martino, Richard Billings of LIFE Magazine and a LIFE photo journalist. None of the Cubans were cleared through standard CIA security protocols or given operational approval. And from a security standpoint, having two LIFE magazine employees recording the mission – as well as the implication that the information and ultimately the Russians would be passed on to Senator Eastland’s committee – is totally outside the boundaries of standard CIA practice. Yet as the following documents reveal, it all happened and the mission was signed off on by various operations personnel including Deputy Director Marshall Carter and COS Shackley. Indeed the chief of the Cuba project, Desmond Fitzgerald was also read into the program at a certain point. Incredibly, there is no sign that approval went above these individuals, to the Director of the CIA and certainly not to the Special Group Augmented, RFK or the President himself. The Operations staff at JMWAVE acted totally autonomously in supporting the mission, treating it as an intelligence collections effort, risky but within their mandate. The political implications of success were studiously avoided in the written exchanges among all parties. I’ve written about the TILT mission itself in great detail, providing both action and after action reports by Rip Robertson (Rutherford) and David Morales. The mission itself failed, with the officers in charge determining they had essentially been scammed, with Bayo using them simply to get a well-armed resistance team into Cuba. Perhaps most amazingly, even the most basic security cleanup was not done, with the LIFE photographer simply walking off with his film. It didn’t go into LIFE itself, but did later appear in a soldier of fortune magazine – which is why you can see it yourself in the following photos. All of which suggests that a great deal more autonomy within CIA field operations than the President realized, or that anyone within among the JMWAVE field personnel appear to have questioned. Posted by larryjoe2 on April 5, 2019 in Everything else. Covert and deniable military/paramilitary activities continue to be one of my main interests. While I spend most of my research and writing time on historical operations, I do try to keep abreast of contemporary activities, especially changes in practices and emerging trends. As Stu Wexler and I described in Shadow Warfare, one of the most dramatic trends over the last couple of decades has been the moves by both the United States and the Russian Federation to conduct paramilitary operations in the open. That includes operations both to support favored regimes and activities designed to overthrow or otherwise bring about regime change. The U.S. began that trend in its response to the 9/11 attacks, sending covert/deniable CIA paramilitary personnel to Afghanistan in an effort to oust the Taliban regime. Extensive pains were taken to covertly infiltrate the CIA officers, later joined by only a handful of regular military when it became clear that forward air control and target illumination would become key to the air campaign that emerged. Of course initially no one anticipated what would become a decade’s long war, one fought by conventional, uniformed military forces using a truly immense amount of combat air support. And it has to be noted that the CIA went into Afghanistan at a time when the Bush Administration was still advocating a purely tactical hunt and kill type response to Al Qaeda, and swearing that it would never enter into regime building or policing in that nation. The next stage in what became a move towards overt practice came with the decision to actually hire American contract paramilitary – Backwater – personnel to provide personal security for the new Afghan government leadership. Objectively it seems that it would be a bad sign if the designated leader has to have foreign military security – it seems to echo the practices of the European global empire era. Now with decades worth of Afghan experience that might now be truly viewed as having been a leading indicator to future problems. Using contract paramilitaries to provide leadership security is one thing, deploying them as a security force to deal with protests and insurgency is another – and of course that was the next phase in Afghanistan, prior to full scale American military deployment. After a number of high profile examples of the risks associated with private military contracting firms, the weaknesses of such practices (perhaps “temptation” is a better word) would seem to be pretty apparent – however as recently as 2018 a serious effort was made within the Trump Administration to actually turn over the war against the Taliban to a Blackwater like private contractor. While that 2018 effort appears to have failed for the present, events soon demonstrated that Russia was more than willing to implement the same model – in Syria – as a counterpoint to their conventional military presence there. While the Russian contractor experience in Syria appears not to have proved nearly as effective as it had the Crimea, there is no sign that President Putin has any intention of abandoning it as an option. Its 2019 and the private Russian military contractors remain a tool for the Russian Federation – reported arriving in the Sudan and most recently in Venezuela. Its obvious that Russia has increasingly turned to the private contractor model (with financial relationships protected by a network of shell companies which make the CIA fronts of the Cold War look like elementary school ventures by comparison). However the United States has moved to a primary reliance on its Joint Special Operations Command, its Military Assistance Groups and on joint military exercises. All with the stated intent of preserving regimes that it feels are vital to national security – and in pushing back against terrorist groups prior to their gaining an international reach. On one hand all this openness seems like a good thing. Activities that were once done under cover are now in view in plain sight, announced in American news releases. Or with Russia at least tracked though the movement of unmarked aircraft and the appearance of “little green men” in camouflage uniforms. Of course being “in plain sight” doesn’t seem to have the impact that it once carried. Statements and actions that would have amazed us during the Cold War are making routine appearances in political campaigns and presidential news conferences. It seems clear that the public has come to accept things that would have shocked it into action in earlier decades – or perhaps its just that nobody cares that much about reality as compared to the internet? Still, there remains a possibility that there are still covert things going on behind the scenes. In fact some rather “old school” practices may still be in play on occasion. Posted by larryjoe2 on March 28, 2019 in Everything else. One of the topics that comes up in regard to the political assassinations of the 1960’s is that of “programmed assassins”, a concept largely ingrained in the popular psyche by the movie “Manchurian Candidate” and reinforced repeatedly over the following decades in articles and books. Perhaps the most active discussion has been around Sirhan Sirhan and the assassination of Robert Kennedy Jr. However other attacks have raised the same thoughts, including the shooting of Ronald Reagan. In addressing the topic it is important to isolate the type of total mind control envisioned in the MKULTRA project, where personalities were literally destroyed and presumably reconstructed to design, from practices such as “brainwashing” and hypnosis. I certainly urge anyone interested to read some of the historical studies of MKULTRA, they are tragic but they will give you a good handle on how personality deconstructions can be done, and insight into how difficult it is to reconstruct even a minimally functional personality when certain of the techniques are used. These two sources give some balance, one from the CIA and the other from a medical professional, both are available from Amazon. Some of the CIA historical material is also available online. Its beyond sad but the medical information is necessary to get a true appreciation for the techniques themselves – and what is required in terms of time and materials to implement them – certainly there is/was a wide variety and some methods were much more invasive (requiring prolonged treatments) than others. A deeper study is really vital to give you a much fuller understanding of the difference in the real medical practices and that of brain washing/conditioning, which often requires both sensory deprivation and torture. And which in turn is far different from hypnosis or even practices such as visualization. My contributions during the program were largely from my own studies of Sirhan Sirhan and his various experiences with hypnosis, self hypnosis, visualization, auto suggestion and a variety of other similar techniques – all of which were observed by his family, and which he eagerly and openly shared with several of his friends and associates. For some reason, those practices and the guidance Sirhan received from his “new age” guru Thomas Rathke do not get much mention discussion these days. Nor does the letter that researcher Lynn Mangun, a friend of the Sirhan family, recovered which contained a warning to Sirhan that he must stop certain of his practices before something terrible happened. Those points and are great deal of related information including Sirhan’s remarks during police interrogation immediately following the shooting are covered in one part of a series of my essays on the RFK assassination that you can find at the Mary Ferrell Foundation. My own opinions on Sirhan Sirhan and his susceptibility to hypnosis and experience with it and related practices is described in both the article and the interview so there should be no need to go into that further here – in what has become a really long post. Posted by larryjoe2 on March 18, 2019 in Everything else. Questions keep coming up in regard to certain items of my earlier JFK research (almost 30 years overall at this point ) – some of the most frequent are about the DalTex Building and Dallas Uranium and Oil, Ray January and Red Bird Airport and about the 112th Military Intelligence (Corp) Group and the purported “security stand down” in Dallas. By this time I think a search on my blog posts here were answer most questions about the first two, for that matter I’ve recently including more information about Ray January and Red Bird in certain of the Wheaton Names posts that I have been making here. However I also wrote an extended article on the 112th for JFK Lancer’s Kennedy Assassination Chronicles and I think it will answer a lot of questions; it includes information on the Dallas 112th office as well as the headquarters group. To a large extent it is based on ARRB era document releases. The Crisman saga is strange indeed, even a handful of such characters is enough to poison a very large well. Hopefully this will help anyone visiting here that may have interests in these topics, if I’ve missed something you are interested in let me know. Perhaps I’ve done some work on it – looking back I’m amazed I survived venturing off into just the areas listed above. Posted by larryjoe2 on March 10, 2019 in Everything else. Long time readers of my posts will know that I write about a broad range of subjects that I feel relate to national security, including the political assassinations of the 1960’s as well as topics of military history and political warfare. All of which means that I’m occasionally venturing out on a limb in regard to some subjects, even though I remain stringent about documentation and source vetting when I do so. Probably the best example of that is my work on UFO’s as an issue of national security, covered in my book Unidentified; The National Security problem of UFO’s. It’s certainly a challenging subject but my approach is historical and security related, evaluating the history of military reports from a threat and warnings intelligence perspective. Apart from the book itself I remain active in studies and analysis, and was pleased to recently be voted onto the board of a group devoted to the scientific study of the subject – the Scientific Coalition for UFOlogy. The SCU will be hosting its first research conference this spring, in Huntsville Alabama. I’ve included a link which discusses the conference. In addition, I’m working on a project involving pattern and trend analysis related to the physical and flight characteristics of a set of very high quality, close range incident reports covering a period of several decades. I’m doing that with my friend and fellow SCU Board member Robert Powell, who has most recently been involved with an SCU study of what has become known as the Nimitz incident, involving multiple military contacts including films of extremely anomalous aerial craft. I’ve included a link for that as well. I hope you find the subject interesting; feel free to ask any questions that occur to you here or by email at larryjoe@westok.net. I’m continuing my other work as well but thought an update on this subject was in order. Posted by larryjoe2 on February 27, 2019 in Everything else. One of the comments to my previous post quite accurately pointed out the fundamental problem in evaluating whether the threat/warning cycle is actually working – if it’s working well you may never know it, at least until threats are aborted and announcements are made. While that is quite true for discrete, operational threats, it may be possible to get a sense of whether or not the overall system is being “optimized” for a given period of time. Optimization requires that all elements are working on the same priorities, that resources are allocated according to those priorities, that there are no known threats which are being neglected and that all parties are equally engaged. And “all parties” not only means the different agencies and services involved in intelligence collections and analysis, it includes the national political leadership that issues the directions that drive the resources and priorities. If that leadership is not issuing directions and personally engaging with the threats and warnings identified by the intelligence community exposures arise. One of the most contemporary and dramatic examples of disconnects in priorities and engagement can be found during the six months prior to the attacks on America in 2001. An easy enough failure to see in retrospect, however even at the time it would have been clear that there were some serous disconnects between the foreign policy priorities and objectives of the new Bush Administration and data that was being developed within segments of the intelligence community. That can be seen not only in the complaints of senior advisors such as Richard Clarke (the former National Coordinator for Security, Infrastructure Protection and Counter–terrorism) but with indications in the public record. Those I found them in a mind numbing dive into a variety of 9/11 interviews as well as in contemporary committee testimony – the sort of thing nobody ever reads until something goes terribly wrong. That directive deals with “offensive” cyberwarfare. However there are no signs of directives for defensive cyberwarfare, for addressing social media warfare or any directives relating specifically to Russian political warfare or interference in American elections. Nor are there any specific memorandums dealing with intelligence community or agency threats to the actual mechanics of the elections process at either the state for federal level. In terms of numbers of such directives, the Trump Administration’s engagement with the intelligence community can be compared to other administrations. President Reagan issued 9 intelligence related directives, President H.W. Bush 4, Clinton 2, George W. Bush 2 and President Obama 2. The titles of each are on record, even if the documents themselves are confidential. Obama’s two directives dealt with cyberwarfare and signals intelligence. He also supported and signed legislation to significantly increase the authorities of the Director of National Intelligence and among other things require “vulnerabilities” studies that would be reviewed with the President and forwarded to Congress. With reference to this public record, it is also possible to get a feel for the existence of any “disconnects” between the Presidents’ priorities and the assessments of the national intelligence community. Those assessments show up both in extended written reports and in Congressional testimony. Readers can make their own assessments as to whether the current threats and warnings expressed by the intelligence community are in sync with the priorities and focus of President Trump and his administration. As to my own concerns, I’ll illustrate them out with a few references. I’ll leave you to read them and draw your own conclusions. And as a closing note, check out these recent news items, suggesting why you should perhaps be more worried than you were….and why President Trump might want to reconsider his priorities…. Posted by larryjoe2 on February 16, 2019 in Everything else.